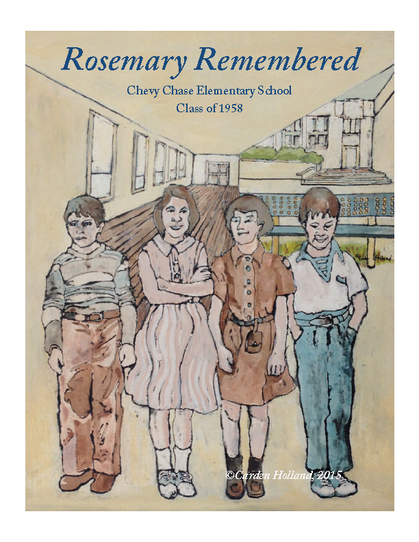 This web site is for all who attended Chevy Chase Elementary School at any time with the class that would graduate in June of 1958. The website was started in January of 2015 and has already helped to organize a reunion and produce a yearbook. Read on to see our goals. Kindergarten 1951-52, First grade 1952-53, Second grade 1953-54, Third grade 1954-55, Fourth grade 1955-56, Fifth grade 1956-57 or Sixth grade 1957-58. Check out "Refrigerator Door - stuff to share" and keep those PDFs and links coming. Francie's is the most recent posting. Our Class Brick now adorns the Rosemary terrace. For those who can make it, we are planning to have a gathering for lunch on Friday, May 3. Location TBA, Time: probably 1:00 p.m. This is being cooked up by classmates who are members of the high school class of 1964 whose high schools happen to be celebrating their 55th reunion in D.C. on May 3 and May 4. If you are interested in participating or learning more, please contact Jim McC. or Rich M. by mid April and we'll contact you directly with the details. l-r: The director of the National Cherry Blossom Festival, Kathy McH. R., Bonnie M. K., Tim W., Diane McC. 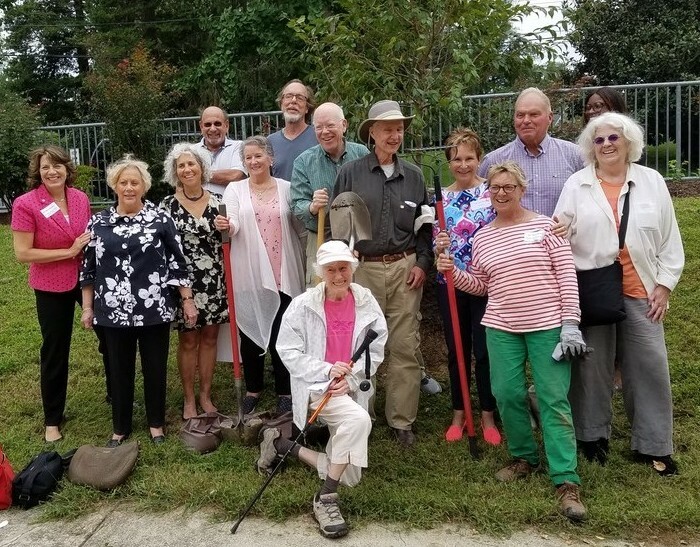 P., Jim H., Francie V. K. (kneeling), Rich M., Jim McC., Kris O. R., arborist from Cherry Blossom Festival, John S., another represenative of the Cherry Blossom Festival, Mary Ellen P. Absent from photo: Allie P. C.
Class Dedicates Two Cherry Blossom Trees at outdoor all-school assembly. 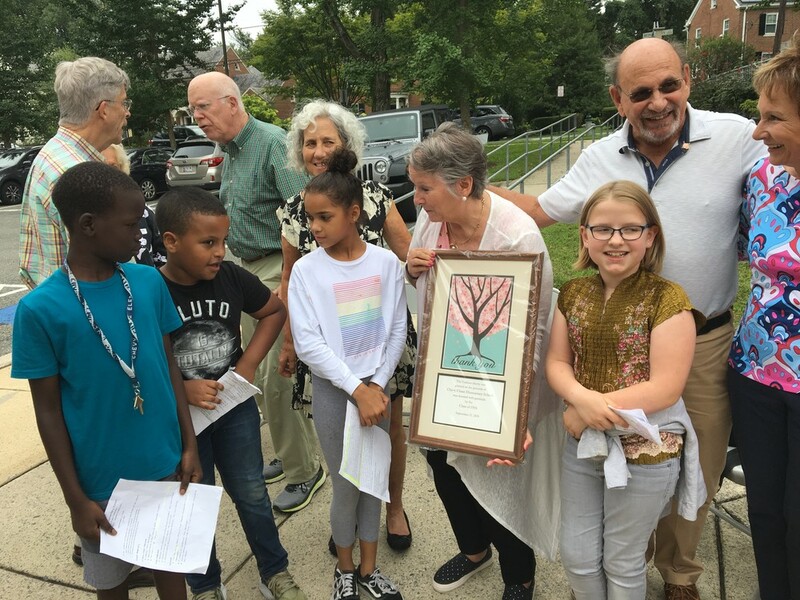 Rosemary students admire the plaque that explains our gift of two cherry blossom trees to the school. l-r: Hank P., Rich M., Bonnie M. K., Diane McC. P., Tim W. and Kristen O. R. All five hundred students joined us for the dedication of the trees, which are located between the main entrance and Rosemary circle. For more photos of the reunion click on Photo Gallery. 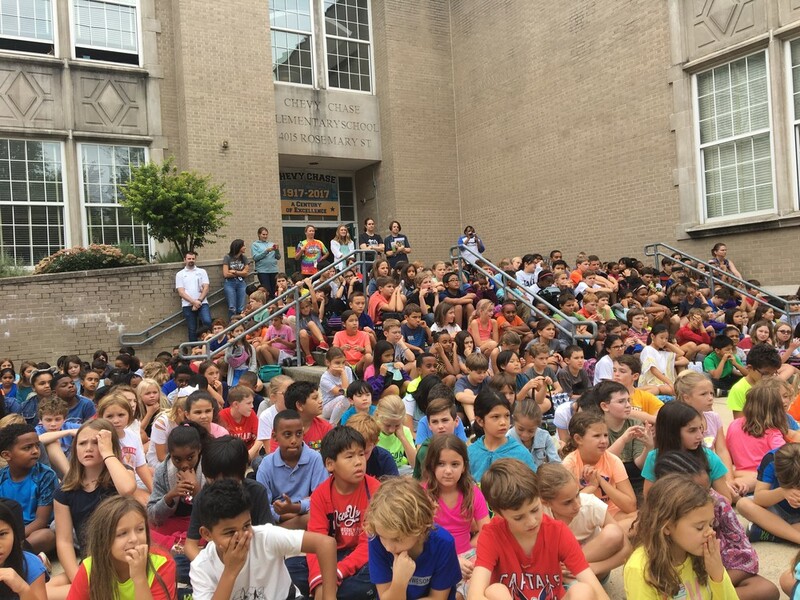 Read about the celebration of the the school's 100th anniversary. 200 (approximately) students were ever in our class, for at least for one grade, K-6. 180 of those 200 have been identified by name, sometimes by just a first name. We estimate that there are about 20 more classmates whose names we have not yet conjured up. Some of the unidentified faces appear in the kindergarten and first grade photos in the yearbook and at the bottom of the page. Perhaps some of these faces belong to classmates who have already been identified. We don't know. Maybe you can help. 90 (60% of the known living classmates) are members of the website. In all, 92 have joined but 2 have since passed away. 30 classmates we have no information for whatsoever. To see who those 61 are, please go to "More info on missing classmates"
NEW 9/19/2016: Search for classmates in the yearbook. We have put the yearbook photos on the website as one PDF, which you can search just like any other PDF file. This is on a page restricted to classmates only. See the new link at the left, just below "photo gallery" and look through all of the photos with identifications as they were as of publication time, September 2, 2015. If you can make any corrections or additions, please find the class photo at the bottom of this home page to make your edits. Guesses are welcome! If we get enough participation in this effort, we will update the yearbook photos with all the corrections. Our Yearbook cover by Carden Holland. The framed original was presented to the school at our 2015 reunion. Read the Story in Washington Post about our reunion. See all the reunion photos in "Photo Gallery"
Find everyone who was ever in our class and encourage them to join the website. 100 classmates by June, 2018. Find out who has passed on and post memorial information about them. Identify by name every face in all our photos. Get Mrs. Phillips' class photo -- the one photo we still don't have. Have a social event in the DC area each year. Keep this website growing and active through September of 2018, after which we will have to renew the license with classcreator. If we want to keep it free of advertisements, it will be expensive. Otherwise, the charge is nominal. We have contact information for more than 100 classmates. Of the 93 that have joined the website, three have since passed away. The 100 members goal was not reached by June of 2018 but it still remains a goal. We have not welcomed a new classmate for about a year. To date we have confirmed the passings of 29 classmates. See "In Memory." Please write a comment if you are moved to do so. We have made a single PDF of all the yearbook class photos, with the identifications at the time of publication. This file will allow you to search for any classmate and blow up the photos to a larger size to make identification easier. Corrections and additions can be entered by clicking on the appropriate class toward the bottom of the home page. Still no progress in getting Mrs. Phillips' class photo. Go to Mrs. Phillips' photo page below to see who we think was in her class. Someone out there has this photo! Now we're beginning to think that for some reason, this photo was not distributed to students and it wasn't retaken. We had a reunion attended by 27 classmates and 14 spouses in September of 2015. There was a mini-reunion on Feb 24 and 25, 2017 attended by 12 classmates and 5 spouses. We had a micro-reunion on April 10, 2016. Many people continue to have small get togethers as a result of being reunited through the website and reunions. Classmates have found other connections through this website, such as learning that they have mutual friends or interests. 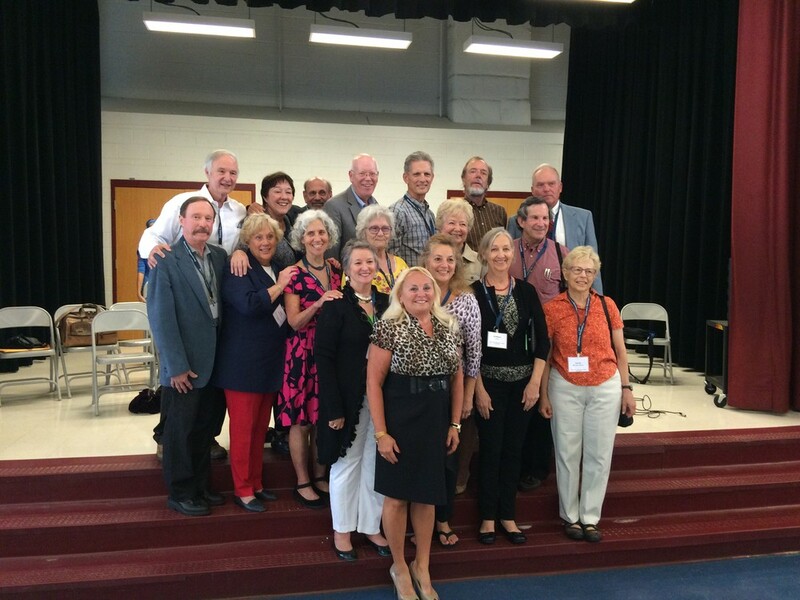 We had a 60th anniversary reunion in September of 2018. For all the details see the special page devoted to it. The website will continue but starting in the second week of October, 2018, we will go back to having advertisements because we do not have the money to pay for the ad-free option. ALL THE LINKS TO THE YEARBOOK PHOTOS ARE ON THE BOTTOM OF THIS PAGE. Please find yourself in the photos and help us to make corrections and new identifications. You can post and read comments on the In Memory page? You can post general comments on the Forum page? We are still identifying classmates in the class photos and then posting corrections and additions to what was published in the yearbook? See the bottom of this page and the Revisions, Additions to Yearbook page. You can send a message to any member on the website? "Send a private message to ___" It is not as quick as email but the message will be waiting for them in their message center. There is useful information on the First Time Visitors page? WE ARE STILL MAKING IDENTIFICATIONS IN THE PHOTOS. PLEASE TAKE A LOOK AND HELP IF YOU CAN. Note: These photos and identifications come straight from the yearbook, which went to press in early September of 2015. Please feel free to enter comments, additions or revisions so that we may get things right, even after publication. There remain about 75 faces to identify, mainly from the early grades. Faculty (c.1957) -- probably does not include all of our teachers and probably includes teachers we didn't have, but this is all we have at present. Friends of Chevy Chase Circle. Yes, there is really such a group!